After finishing off two sweater WIPs in December (Cabled Turtleneck and Boxy), realizing that I have at least six sweater quantities of yarn in my stash, and the hubby reminding me that NH Sheep & Wool is coming up soon (in three months), I’ve been motivated to knit more sweaters. Added 8 extra stitches in the bust, on the front only. I worked 4 additional increase rounds, and then decreased those stitches away below the bust. Made the neckline narrower by picking up stitches around it, working 4 rounds in reverse stockinette (purl), and bound off in purl so it rolls inward. I shortened the sleeves by eliminating the last ten-row repeat (which eliminated one decrease round as well). The sleeves would have been too long (more like full length instead of 3/4) without this modification. Though this wasn’t really a modification, I opted for the garter stitch edging option on the bottom hem and sleeves instead of letting the stockinette roll up on itself. This was an enjoyable project! I love how Heidi incorporates the increases (yarnovers) as a design element at the neckline and down the sides. And the raglan increases flow nicely into diagonal panels from the underarms to the bottom hem. Instead of knitting flat in rows as the pattern specifies for the cardigan version, I worked in the round and added five steek stitches down the center front. I despise the idea of knitting a buttonband separately and sewing/seaming it on. Instead, I followed Kate Davies’ steeking tutorial and knit stockinette facings in a “steek sandwich” with an I-cord bindoff. Mine had the added twist of being worked with a little intarsia where the colors changed in the yoke. I knit this pattern by Julia Farwell-Clay before, but as a pullover. I really enjoyed steeking and I’m looking forward to doing it again on another project someday. I liked the idea of the steek sandwich, but wasn’t happy with how thick it made the buttonbands. The I-cord edging gave a nice finish, especially with the buttonholes worked right next to it so they sort of hide a little when the cardigan is unbuttoned. Next time I knit a steeked cardigan, I’ll probably finish the steek on the wrong side with ribbon or fabric instead. The yarn I used isn’t available online anywhere that I can find. It’s called Cheshire Sheep Yarn (100% wool) and it came from a farm in Nelson, NH that had a booth at NH Sheep & Wool. It was extremely pleasant to work with; it had a bit of a rustic look in the skein but was relatively soft to the touch. It appeared to be a woolen-spun yarn and worked up to more of a chunky gauge, though the weight to yardage ratio was more in the Aran range. Once washed, it bloomed and evened out beautifully. As I write this, the cardigan is still on the bed drying, and I haven’t yet sewn on the buttons. I’m going with these cat buttons from Katrinkles, and plan to sew them on using embroidery floss in the same colors as the yoke (making bowties magically appear on the kitties). The buttons are another thing I bought at NH Sheep & Wool, last year. If you look closely at the photo below, you’ll notice the color changes in the buttonbands differ on each side. I knit the one on the right (left front) first and wasn’t sure I was happy with it. I’m not entirely happy with how it ended up on the right front either. But once I’m wearing it, I don’t think the difference will be quite as noticeable. When buttoned, the buttonbands will overlap; and when unbuttoned, they won’t be right next to each other. And now that I’ve finished knitting this sweater (in just three weeks! ), I’m looking forward to the next one. I’ll be making another summer top, Novel-T by Laura Nelkin. I’ve already downloaded the pattern, but I’m making myself wait until I get the buttons sewn onto my Hiro cardigan before casting on anything new. I hadn’t planned to participate in NaKniSweMo (National Knit a Sweater Month), but I just happened to cast on an adult-sized sweater on November 10th, and figured I would try to finish by the end of the month. At a total of 48,396 stitches, my sweater falls a little short of the NaKniSweMo requirement of 50,000 stitches; however, it’s an adult-sized sweater, and it counts as far as I’m concerned. The sweater is my prize! And I’m especially proud and a little surprised that I finished it in two weeks. Notes: This is my “FrankenHiro” because I combined elements of four different sizes. Fourth size for cast-on almost to underarms; second size for sleeves; third size for yoke; and smallest size for length of body from bottom to armholes. I also knit the sleeves 1″ shorter than the length for the smallest size. To transition from fourth to third size before the underarms, I decreased a total of 10 stitches in the span of 17 rows above full bust. I used larger needles for the sleeves since my gauge tends to be tighter when working magic loop, and the sleeves already seemed kind of narrow at the bottom. 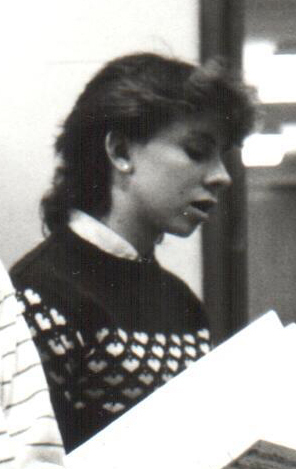 Yearbook photo of me in chorus practice, wearing the aforementioned sweater. In my updated version, I would move the hearts up onto the yoke. Running them across the bust just would not be a good look for me at my 44-year-old bust size. Until I pulled the photo out today, I had forgotten there were little dots between the hearts. (I believe the technical term is “lice”. Ew.) Definitely want to incorporate those, though, to avoid long floats. 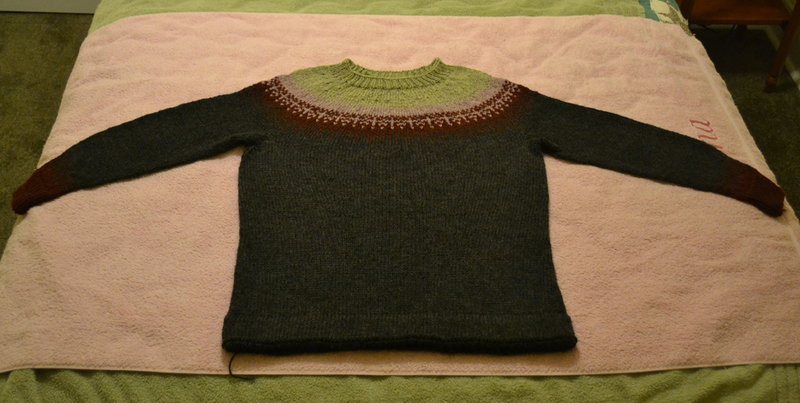 You can probably see in the photo that the original sweater had set-in sleeves; mine will be a seamless round-yoke. I may also incorporate a slightly rolled neckline, cuffs and bottom hem as on Couronne, instead of the traditional ribbing. Due to the smallish size of the hearts, I’ll probably be knitting this one in sport-weight yarn, most likely Classic Elite Liberty Wool Light. There are other sweaters (well, at least one) that I want to knit before taking on the retro heart sweater, so it will probably be a while before I post any more about it. 2018 in review: socks, hats, a couple sweaters, and some other stuff! Catching up – the past 7+ months!